Couldn't have asked for a better make-up artist! Sylvia was my make-up artist and stylist for my actual day and to say that I was in capable hands is a gross understatement of her expertise and amazing skills. 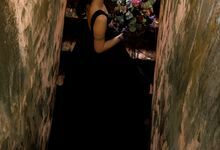 She seeks not only to beautify but also understand her clients' personalities and needs. Her professionalism and high standards for her work has left a deep impression with my husband and I. I received compliments for my look from family and friends on the actual day and this is all thanks to Sylvia's dedication to her craft! Thank you so much, Sylvia, for the amazing work that you've done for my morning and evening look on the actual day! You've made it so easy and comfortable for us throughout the whole experience and I will definitely recommend your services to my friends! Thank you for your generous review Joy! 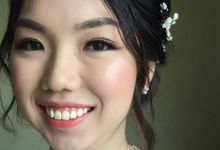 It’s great pleasure to be your wedding makeup artist. Congratulations and wish both of you a lifetime of happiness! I have engaged Sylvia for my Big day after looking through her portfolio on a few social media platforms. 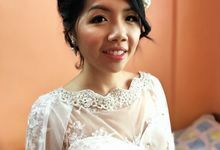 Boy, can i say I am really glad that I have engaged her as my mua for my bigday! 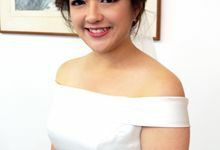 I hardly ever write reviews for anyone but I feel that Sylvia deserve a good write up compliments from me for making me such a beautiful bride that day. 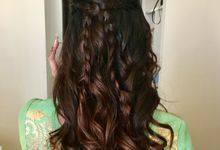 Not only is she professional( she arrived very early in the morning before our scheduled timing ) , she can also do wonders to my hair by creating hairstyles that I really loved! 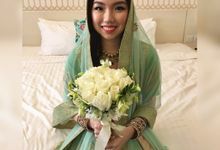 -moreover I even received alot of compliments from my friends such that they are keen to engage her next time for their big day! 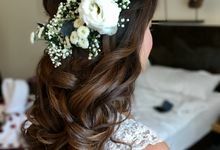 It was really a blessing to have such a wonderful and friendly mua, who can meet up to my expectations on which kind of hairstyle and makeup I want. She definitely deserve a 5 star rating! 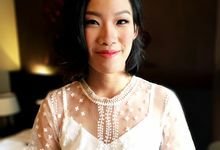 Sylvia was very professional, and I received so many compliments on my makeup on my wedding day! I rarely write reviews unless I truly believe in it, but I have to share how amazing Sylvia was. Sylvia did an amazing job as my hairstylist and MUA for my wedding, and words cannot express how happy and grateful I am for her. 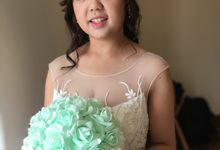 I am very glad that I entrusted my big day to her hands, and not only is she very skillful, I will not forget how she took the time to calm me down when I was anxious and stressed. 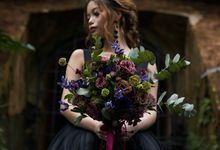 I could definitely tell how much effort and love she puts into her work, and I believe any bride would be in safe hands with her. 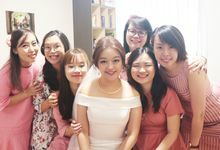 My wedding party even said that they will definitely hire her as their MUA and hairstylist for their weddings! We are honored to have you be a part of our wedding. 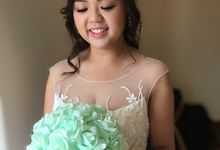 I felt so beautiful on my wedding day! I am glad that I have been given such important role on your wedding day and I am blessed to have appreciative bride like you! Thank you for the heartwarming compliments! 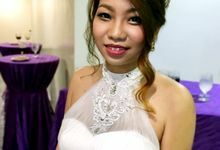 I engaged Sylvia for: (1) Bridal Trial (2) Bridal Make Up- 2 looks (3) My mom-in-law's make up She was very friendly during the trial, provided good feedback on hairstyles and make-up suitable for me. She was always prompt in her responses and very open to ideas. On the actual day, we started at 5am. 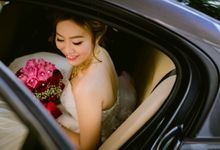 She was bright, cheery and managed to transform me into a beautiful bride. I have single eyelids but she managed to correct them nicely yet naturally. 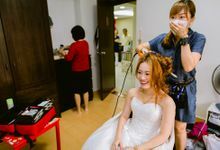 After my make-up, she had to proceed to the hotel to continue my mother-in-law's make up. Following which, we had touch-up for our 1st march in (including groom!) and shortly after, preparation for 2nd march in. Time was tight, but she was calm and very caring. She even accompanied us down to the function room before both march-ins to ensure that my make-up and hair were in tip top condition. Thank you Sylvia, for being part of our wedding reception. Thank you for sharing your experience and for having schedule planned out so well! Enjoyed doing makeup for you :) Thanks for the wonderful day too! 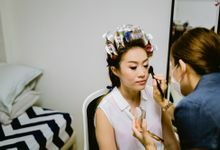 Usually 2 - 3 bridal makeup sessions is arranged for an Actual Wedding Day. 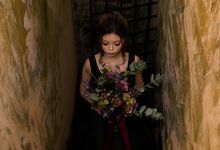 The number of makeup touches can be adjusted upon request. Sylvia provides only dedicated and quality makeover experience to every of her customers. Her work focuses to enhance her clients' features at best to achieve natural and elegant looks. Please view pricelist for more information regarding my service packages.